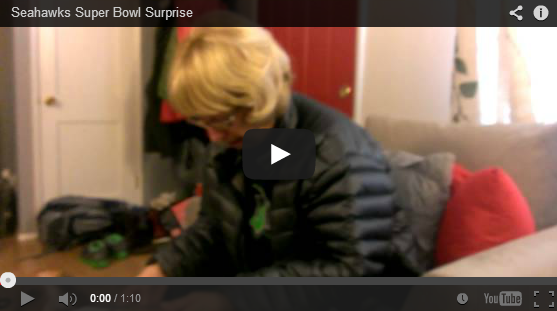 Surprising mom with Super Bowl Tickets! Go Seahawks! Flash forward to the late 80's and I got to go to my first Seahawks game with mom, dad, and my older sister Michelle, against the Broncos of all people. That was my first football memory, to be replaced for a number of years by Ken Griffey Jr. and the Mariners, but football would always be there. I remember seeing my first live kickoff like it was yesterday, and remember Curt Warner, Brian Blades, and Cortez Kennedy vividly throughout my childhood. After high school in 2002, my parents were able to get season tickets for the first time. I was spoiled and got to take a friend on a lot of occasions, but as soon as I headed away to college, mom got Seahawks fever, and wouldn't miss another opportunity to be in the seats. 2005 we moved seats to the northwest side, 200 level, and we witnessed the best regular season in Seahawks history (since that 12-4 in 1984). The Redskins game went well, and the NFC championship against the Panthers couldn't have gone any better. Mom and I were out of our minds at that game, and revealed in the postgame celebrations, grabbing confetti to remember it by. We hoped to go to the Super Bowl in Detroit, but flat out couldn't afford it. My dad promised that next time he would send us, with the thought that next time may very well be into my own old age. 2011 we went to a day of training camp for the first time and saw some young late rounder dancing on the field after practice, and started to fall in love with the current squad. Starting that year I wasn't able to go to any games with mom, as I had begun to move forward in my career as a camera man and have been lucky enough to work them. That would hold true all the way through this year's NFC championship run. It was Super Bowl time once again, and the thoughts came back that it was time to find a way to go! My parents and I looked at it, and realized pretty quickly, that there was no way to make it happen financially. It was just too expensive, and with my sister, and my own weddings coming up this year, it just didn't seem meant to be. A week later I found myself reading a headline on Bing about the falling prices of Super Bowl tickets, a surprising situation attributed to cold and cross-country travel difficulties. Naturally I figured I'd take a look and price the whole thing out. PrimeSport.com, tenth row tickets for $1000 cheaper than a week earlier... Delta flights in and out of JFK with seats available for a manageable price... A hotel less than three miles from the stadium for a half-decent price... I texted my dad at 9:55am Pacific time and he texted back four minutes later. We decided to pull the trigger and not tell her until the tickets came. As I was purchasing flights with my fiancé Sarah, my best friend's wife Jessica walked in and we started scheming to get Jesse (my best friend from Kindergarten to today) in on the action. Moments later he walked in and we hit him with the idea, and he loved it. Thanks to a random headline I saw out of the corner of my eye after giving up hope, myself, essentially my mom's second son since I was five years old who she rarely gets to see anymore, and most importantly mom herself are heading to see the Seahawks play in the Super Bowl. Mom was there for the send-off of the Seahawks in person, with no clue of what was coming. She came to my house to see me and my dogs, and the FedEx guy arrived and I signed for the package. I opened it, and handed it over to her. Thirty years after she skipped their welcome home for my sake, I was able to return the favor in the biggest way I could ever think of. I'm excited to go see the game, but there was nothing more meaningful than to see my mom's reaction that I've shared in the video.